Rason's Legal Code — Choson Exchange - Visit North Korea & Support Local Entrepreneurs! 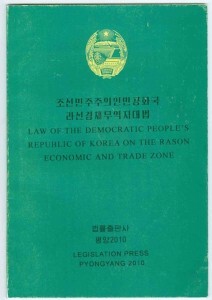 In 2010, the DPRK revised the laws governing Rason Special Economic Zone. This booklet, scanned into pdf form, sketches out the new laws in both Korean and English (English is in the back half). It was at this time that the authorities removed Rason from provincial administration, giving it more autonomy in some ways, while also giving authorities in Pyongyang a more direct link to planning for the SEZ. Geoffrey: Some of the things I like are the decentralization of decision-making to the province, the allowance for managerial autonomy, and an emphasis on technical training. That said, these things will all boil down to implementation. As rule of law and legal training is a cornerstone of our work, we think there are opportunities to work with Rason in the future on such programs and we will continue with our project scoping and audience due diligence before deciding whether an expansion is warranted. For an analysis of Rason's prospects check out Andray's paper at the Korea Economic Institute.